Customized ligament protection for your knee. Ideal for athletes who participate in contact sports and want to prevent a knee ligament injury or re-injury. Is the Defiance Custom Brace for me? Ideal for athletes participating in high collision sports and want complete ACL and ligament protection. Try our Brace Advisor for personalized product recommendations to meet your needs! The Defiance III is one of our strongest knee braces by DonJoy and is recommended for athletes participating in high collision sports, like football, motocrosses, or skiing. The DonJoy Defiance III Knee Brace is one of our top custom knee braces. This brace is also ideal for athletes who participate in water sports like surfing, wakeboarding, or kite surfing. People recovering from ACL and other knee ligament surgeries also use this brace on regular basis. If you are involved in non-contact sports, require a lightweight brace to maximize speed, or want a custom brace for everyday wear we recommend the DonJoy A22 custom knee brace. We will contact you after you purchase this brace to schedule a fitting appointment. You will also then be able to select your color. View colors available. Wearing a custom knee brace means support is applied where you need it most. When you order a DonJoy Defiance III knee brace, one of the DonJoy bracing experts will come to your house or office to take your measurements. Then DonJoy will custom manufacture a brace that fits your exact measurements. This perfect fit ensures the components of the brace align perfectly with your body ensuring maximum protection and comfort during movement. By wearing a brace that is custom manufactured for your knee, you can play your sport with confidence because you know that you're less likely to re-injure your knee. The brace is manufactured to your exact measurements, which means the components of the brace align perfectly with your body ensuring support, protection and comfort during movement. When you order a DonJoy Defiance III knee brace, it will be custom fitted by one of the DonJoy bracing experts in your local area. Upon placing your order, your local expert will contact you to schedule the appointment to take your custom measurements. Please allow up to 5 business days to be contacted. Your brace will be delivered within a week from the date your measurements are taken. Shop DonJoy Defiance replacement parts for kits, undersleeves, straps and pads. Because the DonJoy Defiance is custom fitted and sized for your knee, this product does not qualify for the regular BetterBraces 30 Day Money Back Guarantee or other general returns. Remakes will be done for any manufacturing defects free of charge. Rest assured that DonJoy will work with you to make sure you get a satisfactory and comfortable fitting brace. Attention Hawaii Customers: For those residents of the outer islands other than Oahu, you may be required to visit your local Ortho Clinic to be measured for the brace at your own expense. Or you can be placed on a wait list to meet with one of our Reps that will be flying to your island (lead times will vary and can change). The DonJoy Defiance is not available outside the United State via BetterBraces.com. If you are outside the U.S. please email us and we will direct you to the proper outlet in your country. I received my Defiance brace today. It came with numbered stickers 0-9 and three flower stickers. What are they for? These are accessory stickers you can use to decorate your brace with. If you are on an athletic team you can use the number stickers to apply your number on your brace. Please reach out to our insurance department for assistance 800-548-3370. Thank you for contacting Better Braces. The Don Joy Defiance Knee brace is our most durable knee brace and the Carbon fiber makes it our best brace for football. We have many professional athletes wearing this brace as a support. However if you are unsure its always best to check wtih league officials if they will allow the brace or require you to wear any sort of brace cover. You will need to refer to your Physician or Athletic Trainer regarding return to play as every athlete is different. I have medial radial meniscus tear. Would the Definance lll be a good brace for me? The Defiance is an excellent brace for a Medial Meniscus tear, it would be custom made to fit you perfectly, and has a lifetime warranty on the frame and hinge. I had acl and meniscus surgery a year ago and I was told I need a brace I got fitted for the brace and everything I'm just waiting on it now. If my measurements were sent in Tuesday September 13 2016 how long would it be before I receive my brace? The Defiance Custom Knee Brace should only take about a week to arrive after we receive the measurements, depending on your location and choice of shipping. Im from Ontario Canada and i have a question about the don joy defiance lll custom knee brace. How would i schedule a fitting appointment and how far would i have to go to the appointment. Yes, the DonJoy Defiance III Custom Knee Brace would be an excellent choice. The Defiance is custom made to fit your specific measurements and can be tailored to fit your injury needs. Plus the strong carbon fiber frame will be durable for contact sports such as Rugby. I've had this knee brace for several years and the bottom strap wore down and broke. How do I go about getting this strap replaced? I can't find accessories straps anywhere on the website. However if you are just looking for the one strap you will want to reach out to your local representative for assistance in ordering that one part. My 16 year old son tore his ACL and meniscus playing football, and surgery is required. We will be getting custom knee braces post surgery. I have a 13 year old son who is an offensive lineman. I want to get preventative braces for him. I realize custom fit takes about 2 weeks to receive. My question is, what brace can I get for my 13 year old that he can wear NOW. I want a brace ASAP to hopefully prevent the pain and heartbreak my older son is experiencing. Also, I have 11 year old twins who play peewee football. Do they need knee braces, and what should I get for them? Lastly, is the cost posted here for one brace or a pair? Why would you protect one knee and not the other? The price of all Knee Braces is for a single brace, not a pair. A DonJoy Performance Bionic Knee Brace may be an option for your 13 year old, as it has soft hinges on both sides and comes with stops to help prevent hyperextension and support knee instability with lateral and medial protection. How long does it take for custom braces to be made? Generally from the day you order the DonJoy Defiance III Custom Knee brace it takes roughly two weeks to receive the brace. The timing is dependent on the coordination of the schedules of yourself and the local sales representative to take the measurements for the brace, as well as the shipping method desired. The Defiance III will offer the best protection and support for your knee, and work well for skateboarding. Please make sure with your doctor first that you are cleared to return to your normal activities before doing so. Hi, I recently was cleared to return to basketball after acl reconstruction but my surgeon suggested I wear this brace for a while. will this brace allow me to play close to full speed or will I need to build myself up to full speed? thank you in advance. Yes, this brace will allow you to play at full speed. It may take a few times to get used to playing with it on, but it will not slow you down. I'm a sophomore in high school and I play quarterback. I read something online about quarterbacks wearing this brace. I've sprained my mcl and acl. But I don't want the brace to go to long down my leg or up my thigh. Is it possible to make it shorter? Yes, the DonJoy Defiance III is the best brace to be customized for a person who plays football. It is available in a shorter length than the standard. I had ACL reconstruction 16 months ago and I want to do an outdoor obstacle race (tough mudder) where my brace will be exposed to water and mud. Is there a way to outdoor proof the brace so I can wear it during the race? The DonJoy Sport Brace Cover, https://www.betterbraces.com/donjoy-sports-brace-cover would be an option to protect the brace, otherwise, just rinse the brace after use, with fresh water and allow to air dry. The DonJoy Defiance lll Custom Knee Brace will provide you with all that you are asking for. It is good for moderate to severe ACL or PCL instabilities, post ACL or PCL reconstructions, ACL/PCL combined instabilities (Cl), MCL/ LCL instabilities, and hyperextensions. It is best used for football, motocross, skiing, surfing, and wake boarding and will work fine for soccer and running as well. The Defiance Custom Knee Brace would be the best choice for you, as it is custom fitted for your personal needs. It has an outstanding lifetime warranty on the frame and hinge and would offer the support you are looking for. Hello I play as a Soccer Golie can de DONJOY OA DEFIANCE be good for me since I already have surgery few years ago on my ACL? The DonJoy Defiance III Custom Knee Brace would be a great brace for you. It is custom fitted to your measurements and made to your injury and sport. I recently torn my mcl and lcl, would this be a good brace for me? I am a ski racer. How long does it take to receive the brace. Yes, this would be a Great brace for you. It's not only a rigid brace and will provide the support you are looking for to help prevent any further injuries, but it's also very light, and will be ideal for our everyday activities. The brace its self will not restrict you from any movement. Generally from the day the order is place a representative in your are will contact you to set up an appointment to get the measurements needed have the custom brace made once we receive the measurement it takes about 48 hrs. to ship. I tore my ACL and badly sprained the MCL. I'm a female black belt and need to take a couple of months before I get the ACL repaired. I'm also an active photographer. We do a lot of spinning and jumping kicks, which I will lay off of until I get things fixed. We do some minimal sparring. I'd like to get a brace I can use now and after the reconstruction. I'm looking at the Defiance III, A22, or Fullforce. Or any brace you might suggest. The DonJoy Definace III custom knee brace would be something we recommend. The brace is sized and fitted to fit your leg. The brace its self would provide the maximum support you are looking for and would prevent any further ACL injuries. It is a low profile frame and made out carbon fiber which makes it extremely light and will help after the surgery is done. it does come with a life time warranty on the frame hinges and hardware. A prescription isn't need and once the order has been place a local repetitive will be more than happy to assist you on getting the proper measurements. I wrecked my Harley a year ago and completely tore my MCL, PCL and ACL and broke my tibia and fibula. And I was wondering if the defiance lll custom brace would help me out any? My son plays football and will be entering his senior season next Fall. Luckily he has not suffered a knee injury but as a precaution I am thinking about getting him knee braces. Since the customized seem to be the best would you recommend these for a non-injured athlete? Being custom fitted, do you take into account possible growth in case so that he might be able to wear in college? The Custom Defiance knee braces are worn by many Pro football teams and worn for prevention by offensive lineman. The brace has a lifetime warranty on the frame and hinges and can be refit for a small charge compared to buying new braces. My son is a football player has a Complete ACL tear . He would like to play the season and then have surgery, is that even an option ?? We live in Calgary Alberta , is there anywhere we can get this brace or can you recommend one that is available ? Spokane would also be an option for us. play division 1 college soccer have torn my ACL is this the brace for me? Yes the Defiance is our premier ACL knee brace. The Defiance is custom fit for your knee only, and has a lifetime warranty on the frame and hinges. The brace would come with our fourcepoint hinge and four points of leverage strapping system which will offer maximum support to the knee and help to prevent re-injury. I'm my surgeon has recommend an ACL brace and I've already got an appointment with a rep next week to discuss what brace would be best and to take measurements. However, I'd like to do some research ahead of time. I've got a latex sensitivity and have been using a DonJoy hinged brace with the DryTex fabric. What is the latex content of the non-frame parts of the Defiance and other sport braces by DonJoy? I'm ok with having to wear a sleeve, but if there's a DonJoy sport brace that's latex free I might be more likely to buy that instead. Thanks! Can these braces be customized to fit anyone? The Defiance Custom knee brace is made specifically for one person only. The person is measured with a specific measrueing device and the brace is fabricated based on those measuremnts. Wondering if this brace will work for me. I tore my meniscus back in 08 had surgery but not going to physical therapy for patella formala with nerve damage and meniscus irritation. I purchased the web react knee brace but it doesn't seem to help. Would this brace or another brace work better? I would suggest a hinged knee brace such as the Economy hinged knee brace or the Bionic Knee. these braces have bilateral hinges to provide medial lateral support . The support level is better than the Reaction but a Defiance my be overkill for your knee. Does insurance cover any of the brace? Do you get a discount if you order two? My daughter was prescribed this brace for return to play in sports post ACL surgery. What pads would you recommend for basketball and will this hold up well during softball? I'm debating getting an undersleeve for basketball and cover sleeve for softball..any suggestions? In 2009 I shattered my patella in a car accident. I had surgery to wire pieces back together. I recently had another to remove the wiring and pins. is this brace something I should consider ? 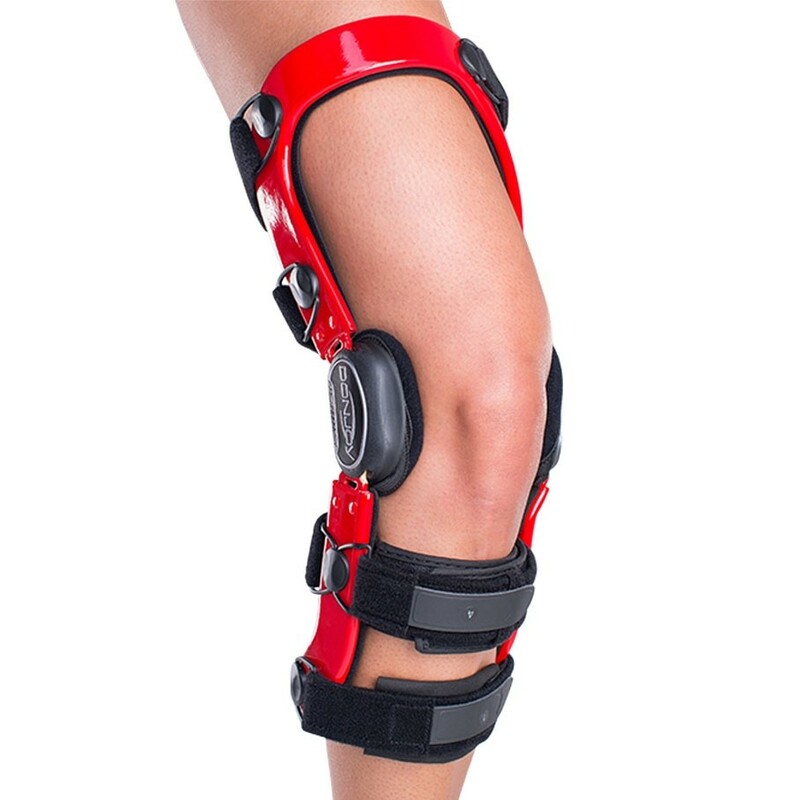 You need a brace that will support the patella and the Defiance is a ligamentous knee brace. The Don Joy Tru-Pull Advanced system would be a better choice for you. The brace provides maximum support tot he kneecapa dn will keep the patella tracking in the correct position. The brace can be made with hinges to give you the bilateral joint support as well. For ligamentous injury and support you will want a more rigid and support tive brace such as the Don Joy Full force ligament knee brace. This brace will prevent the knee from further injury. I have recently tore my ACL, all of my PCL and severely ruptured my medial meniscus. I am in no pain therefor opted out of surgery. I am playing ice hockey at a high level and I will be playing while at college. Is there a brace that would be better for preventing any further injury and for regaining stability? You will want to go with the Defiance Custom knee brace with the fourcepoint hinge for protection of the knee. Do you suggest this or the A-22 for heavy basketball play after Meniscus and ACL reconstruction? My therapist just measured me for a custom do joy defiance 3 so I can return to beach volleyball. I am slowly losing weight. I was wondering if I need a new brace in say a year do I need to pay $300 or is it free? Hello! my daughter is 16 going to Junior she plays volleyball and just had surgery to repair or strength knee patella a problem ,problem is Dr sais she loast some cartilage and may give up colleges volleyball wonder if any of this costum knee braces will help support knee with the tape in hoping she can finish HS volleyball ,thank you. How do you get your brace customized with the red white and blue colors there isnt an option at checkout to ask what color i want? The Custom brace has to be measured with a special measuring device so you will have to make an appointment with a Don Joy sales rep after purchasing and at that time they will ask you which color you want. Hello. I am a power lifter. I suffered an ACL, MCL, Meniscus rupture. Is this brace or another recommended for weight lifting? Can this brace work for a tibial plateau fracture? Can or should you use a sock under? What material is it made of? I'm looking to use this brace while riding motorcycles in a racing environment and I'd like to know how much width the brace adds around the knee. I'm trying to determine if it will fit under my current set of racing leathers or if I'll need to have the leg modified to allow more room for the brace. Is the A22 any slimmer than the Defiance III? The Defiance would be a good choice for your knee while playing football. I'm coming off ACL surgery and I'm losing weight. My doctor said I can get one if I want, and I've decided that I want one. Yet, if I'm losing weight, will that effect the fitting of the brace on my knee? How adjustable is this brace? Will it allow for growth in the leg both vertically and horizontally? If it will how much will it allow before you need a new brace? The Defiance is custom made for your knee size as it is and you have 4 months to get one free re-make for girth changes. After 4 months there is a charge for a re-make. final question for the year -My dr has ordered my Defiance yesterday for my left leg- the Ossur Unloader has been recommended for my right leg 95% b on b- how does the defiance with unloader attachment compare to the Ossur Unloader- If I need 2 braces I prefer my braces be functional and the butterfly's match- Its the girly in me and I am 49, stubborn and refuse to have bi-later knee replacements ) . 1. Is this item FSA eligible? My FSA account says knee braces are eligible without prescription but this is just an expensive one. 2. I am avid hiker/backpacker but the rocky terrains has put strain on my knees. I don't have major injury but often wear knee brace to keep my knees together and still I am careful downhill. Is this the better and ultimate solution to protected my knee? Would I be able to hop from rock to rock wearing this like I used to do? can the tru-pull attachment add on be added after the brace is made? I have a Defiance III being made; If a patient loses a lot of weight ,say 50-75 pounds, can the brace be refitted? With the Defiance lll custom knee brace, is suppose to be one size, do the company send a rep to do the measurement? We purchased a custom ACL brace for my 16 year old son 3 months ago and I cant find the care and maintenance information. The brace is starting to smell and I was wondering how I can clean it. I have OA and one side of each of my knees is nearly bone on bone. We do not want to replace them due to my age. My orthopedic Dr set me up with a rep who sized me and ordered these braces for me. I have had a miniscus tear repaired on 1 knee previously and it is damaged. In reading up on braces I am just curious if this brace will have the off loading necessary to help me or if a different brace would be better? The OA Defiance is the best brace you can have for OA. the brace will offload that side that is bone on bone and should help relieve pain in your knees. What is the weight of the Defiance 3 compared to that of the new A22? I am looking to get a defiance 3 for an mcl injury. I am not sure how the strapping works and have seen all strapping on the braces, would that be the same strapping for mcl? Can I do squats with the defiance knee brace? Will it flex to 90 degrees or more ! Hi there, what's the difference between the Deiance and the Defiance 3? Which one would be better for Football? I've had 2 surgeries on my right knee for torn a meniscus in 2007 medial in 2012 lateral and medial. I just found out I have another meniscus tear in the same knee. Would you recommend this brace? I coach high school football and need something strong enough to hold up if im hit in the knee during practice or games. The Don Joy Custom Defiance III Knee Brace is our knee brace that is worn by professional football players. This brace will provide support to your knee and be able to withstand contact that may happen. The brace is custom made for your leg only and has a lifetime warranty on the frame and hinges. Will this help me while I'm playing soccer? What can you tell me about speed and agility reduction in a running back while wearing the defiance brace as prevention to knee injuries. My 12 year old daughter tore her ACL during a soccer game. The surgeon says that she can not get surgery until her growth plates have stop growing (possibly over a year from now). Can this brace be used prior to surgery to support her ACL and prevent further damage while playing soccer? I suffered a patellar tendon rupture. This brace works for me? I had a knee dislocation, and I tore my popliteal artery- which required a graft to repair it, I also have multiple tears - ACL, PCL, LCL, popliteus tendon, medial retinaculum, and bilateral gastrocnemius tendon. lateral meniscus tears - all in my right knee. My left knee has an ACL that is attenuated - I'm unsure if it is actually torn. What would be the best braces for my knees? I was looking at the Defiance /the A22/ the full force/ or the legend SE for my right knee - I would like something that gives the best support/protection against re-injury. For the left I am unsure - I just need something to alleviate the knee pain and gives me the best protection from re-injury on my left knee. The Defiance sounds like it would be the best brace for both knees. The Defiance is custom made for your knee only and provides the most protection for re-injury. I had a lateral retinacular release and half my meniscus removed. The lateral retinacular release was suppose to help with the fact that my knee cap rotates excessively and when my knee cap rotated outwards it would pull on ligaments in my knee. i also have tendinitis in my knee and have generally week ligaments. I've been to countless hours of physical therapy to "strengthen" my knee but nothing seems to help and i feel as if I'm doing more damage than good. I'm a swimmer, water polo player I also snowboard, but for water polo and swim we do a lot of land stuff like 6 mile runs and we run the football stadium bleachers and even the hill behind the high school and workout in our weight room. I just want to know if there is a brace out there that would help give me support to continue to play my sports in less pain. I have a script from my orthopedic surgeon for a new knee brace. How do I use this in the process of ordering a new one? n order to have insurance pay for your brace you will need to get in contact with the local Don Joy rep in your area. http://www.djoglobal.com/contact-us/sales-rep-locator The rep can help with ordering and billing your insurance. What colors does the brace come in ? I have a meniscus tear that I would like to rehab before trying surgery. I have taken up tennis and I am also on a diet where I have lost 100lbs and will likely loose 70 to 100 more. Would this brace help relieve some of the pressure on the tear while rehabilitating, and would I be able to adjust this brace after the weight loss? The Defiance is a custom knee brace and can be made with a OA hinge that will offload the side of your knee that has the meniscus tear. This offloding will help decrease pain in that area while wearing the brace. When ordering the Defiance we give you four months in which you can get 1 free re-make if your leg changes girth. After 4 months it is a $320 charge. I recently tore my ACL and I'm looking for a sports brace I can get in a gol color can you guys do this or do you know of a place where I can get this? Yes the Defiance III would be the right brace for you to wear while playing football. The brace is custom made for your knee only and will prevent any further knee injuries while allowing you to be completley functional. I had my ACL and MCL repaired this spring. I am planning on skiing this winter and am wondering which don joy knee brace would be the best for my situation. Thank you for contacting Betterbraces. Your ACL brace options are either a Custom Defiance or an Off the Shelf Armor. Both these brace are the most rigid recommended for contact sports where a collison is highly likely to happen. Please contact us and we can explain the options you have on both braces. 1-800-553-6019. Thank you for contacting Donjoy. I recommend you contact your local Donjoy Representative who can help with adjusting your brace. You may need different type of straps, Legend straps grip better and are recommended for athletics. We also have replacement velcro that can be changed out on your brace. See the link below to locate your nearest rep. I have left knee pain that basically runs right down the middle of knee, when I climbs stairs, or do squatting or lunging exercises...... Which brace would be better for me? Hi. Two years ago I shattered my Tibia Plateau and partially tore my ACL. I have had 2 surgeries to one fix it, and two get hardware removed and a clean out. I am still experiencing complete hyper extension in my left knee almost 50% more than my left. I am an avid Snowboarder, Soccer Player, Hockey Player, and cyclist. I was told to get a custom as my legs are real little. What would you all recommend? Also, doe the Defiance one come in other colors than just red? I am recovering from ACL surgery and I need to purchase a custom fit knee brace to wear. I play basketball and football so will you recommend the brace that will best fit my needs? The Defiance III Custom Knee Brace is custom fit for your leg, ideal for athletes who participate in contact sports and want to prevent a knee ligament injury or re-injury. It is custom made for your leg only and it has the combined technology of our 4 Points of Leverage Strapping and the fourcepoint hinge which both have been clinically proven to reduce ACL tears up to 50%. Does the DonJoy Defiance provide a distraction (separation ) of the knee joint, for use on osteoarthritis knee pain? I am a Police Officer and was injured in the line of duty. I completely tore my ACL, both Meniscus were torn, and I have a lot of kneecap instability along with Stage 1 Arthritis. I had surgery Jan 2015 to repair the ACL and meniscus, and am still going through physical therapy. However, the brace that my Doctor ordered hurts my kneecap, and I am going to request another brace. I am leaning towards the Defiance because I not only want the best, but I also don't want to re-injure everything when I am able to return to duty. Is this the best brace for my injuries? Yes the Defiance is the best brace for your situation. You can get a tru-Pull attachment installed on the brace to help with patellar instability if you want as well. The Defiance is our strongest brace and would hold during the work you do. I recently tore my ACL and was looking into a knee brace to support it before I get surgery. Would the defiance III be a brace I would wear pre/post surgery? And would it allow me to play soccer while wearing it? The Defiance can be worn before surgery and after. You will just need to make sure that you are measured when you knee is not swollen or atrophied, be cause there is only one free re-make within four months. Usually if the brace is fit before surgery and you have no swelling then by the time you are ready to wear the brace after surgery is will still fit. There is no guarantee that you can play soccer even with the brace before surgery. The brace will protect the knee but cannot make up for the strength in your knee and leg muscles that is lost after injury. I had surgery on my right knee and would like to return to playing soccer, softball, and basketball. However in soccer it is my dominant kicking leg and I am a strong kicker. Which kind/type of brace would be the best for these sports? The Defiance is our best knee brace for someone who needs to return to sports activity. The brace is made specifically for your knee only and has our fourcepoint technology to help protect against re-injury. I have a knee brace that I purchased in 1996. How do I obtain replacement pads for it? My son's MRI has detected a complete tear of his ACL and a TINY tear in his meniscus. There is no other damage to his knee. We are weighing options but are looking at the possibility of wresting and/or baseball for this his senior year. Any recommendations on knee braces. If any metal is showing it would have to be padded over. If your son is not having surgery then he wold have to wear one of our rigid knee braces to have any chance to play sports. DonJoy Full Force Ligament Knee Brace https://www.betterbraces.com/donjoy-fullfource-ligament-knee-brace This brace is patient ready and can be ordered off this website. I tore my ACL and MCL over the summer and was wondering if the Defiance III brace would work for ice hockey and pole vaulting? I'm also only 5'2 so I was wondering whether a Short thigh or a Standard thigh length would be better? The Defiance would work with both of those sports and yes you would want the short thigh and shot calf on the frame. The Defiance III custom knee brace is our best brace for return to high activity after ACL reconstruction. If you wanted to get this brace you would need to be measured by either a medical professional or a DJO representative. We do have other options that would only require a few measurement that you could do on your own and your Uncle could order the brace for you in the US. Take a look at the Armor https://www.betterbraces.com/donjoy-armor-knee-brace-with-fourcepoint-hinge or the Full Force https://www.betterbraces.com/donjoy-fullforce-ligament-knee-brace. Both of these braces are used for contact sports and have the same Four-Points of Leverage and FourcePoint hinge technology that reduce re-injury of the ACL by 50%, that the Defiance III does. You would only need to measure 6 inches above your kneecap, 6 inches below the mid knee and at the knee joint and find the size that corresponds to those measurements. Great product, gave me back my mobility! I have osteoarthritis in both knees. I am bone on bone on my right knee, but stubbornly have refused to give up tennis - I play 3-4 times per week. After two hours of playing I would be in considerable pain. I received my Defiance III last week and haven't felt any pain at all! I played for 3.5 hours last Friday and another 2 hours on Saturday, then walked five miles on Sunday with absolutely no pain at all! While nothing short of a new knee will fix the problem, this brace has really helped me out! A word of caution though, the knee sleeve is a must as (at least with me) the top strap tends to chafe. Also, if you are going to wear this under your pants, make sure they are baggy, the hinges tend to stick out a bit. I've had an original Defiance since a 1992 ACL reconstruction. After nearly 1000 days on the slopes over the years, the brace remains the mainstay of my ski gear. While I've slowed down with age, this brace has allowed me to maintain my passion for skiing with confidence. I have Defiance III's for both knees. After 30 years of playing hockey my knees would not fetch a plug nickle at a rummage sale. Both medial compartments have arthritis, the ACLs are barely hanging on, the menicus look like a thin shag carpet with holes, and the MCLs are stretched. I wear them for hiking, rock climbing, skiing (both alpine and nordic) and work outs. They perform way beyond my, or my Doctors expectations. Three hour hikes in steep mountain terrain or a day spent climbing overhangs are not a problem. Pros: The custom fit is perfect, they stay in place. No need for a sleeve. Rugged construction. The tech who fit me was terrific. Brace is ok but buy online never through the doctor or a sales rep! I read reviews online before I purchased, several indicated that I could do my own knee measuring and buy online, I didn't believe them. You CAN do your own measuring - the Don Joy and other sites will tell you how - and save yourself a LOT of money. Online my brace cost $900. Through the doctor and the sales rep who "custom" measured me (this is the part I could have done myself), the cost is $1300. And they "gave" me 2 sleeves to go with it, online these cost less than $20 each, but through the sales rep they are $100 and $110 each. Be smarter than me! Save your money and get this brace yourself. It fit like a glove and never bothered me to wear it at all. Felt comfortable right away. Had meniscus surgery and didn't think I'd be able to run again, but this brace made it possible. I ve had two total knee rebuilds (acl). first time took out my knee playing football in highschool. second time playing softball at 42. ihad to have my knee rebuilt. Since high school ive had five braces. I thought i was done for good doing sports. I finally spent the money bought a donjoy. Dont spend the money on two or three cheap ones. I promise you you will not be disapointed. At 45 im playong softball, coaching youth sports, hiking etc. this brace has truely given me back what i had thought i had lost.....thank you Donjoy!! you wont be dissapointed!! PLAY ON! The DonJoy Defiance Knee Brace is meant to support and protect the knee, but primarily and specifically the ACL. Athletes will rely and depend on a brace such as the DonJoy Defiance Knee Brace after suffering from a large injury that generally resulted in a reconstruction surgery. I, myself suffered a detrimental injury to my knee, I was looking for the best quality brace in which I could rely on while slowing going back into sports, specifically soccer. The brace begins halfway up my shin and ends near the middle of my quad. In the brace I feel confident going into slide tackles and simple things such as sprinting and pivoting/cutting, even after nearly a year of rehabbing my knee post reconstruction surgery. The brace, although said to have been measured just for me leg, seems too big at times and never generally stays in one place. Running in the brace feels unnatural and appears to weigh me down. I don't receive full range of motion in the brace and it appears a bit bulky at time. Although I have discovered things I'm not so thrilled about with the brace, I'm very thankful for it. With the guarantee that you will not re-injure the ACL, I feel beyond secure and safe. Definitely recommend it to any young athlete, or any athlete in fact, who is interested in playing at a high level of play after suffering from a serious knee injury. Brace fits and feels great but for $900 it should've come with an under sleeve and any tools that I need to adjust the brace. I got this brace recently, and have skied on it once so far. It took a little bit of tweaking location and tightness of the straps, but after a couple of tweaks, it virtually disappeared. When skiing, if you're not crashing, you're not trying, so of course I crashed. My braced knee came out unscathed, the only unforeseen circumstance is my other knee got a wee bit bruised from the brace. Way better than another ACL/MCL/Meniscus injury/surgery/recovery! Pros: Virtually disappears in use, provides great peace of mind to be able to return to skiing. Cons: Only one very minor one, and not specific to this brace: my other knee got a bit bruised when I crashed from impacting this brace. Any brace would have done that. I tore my left ACL and was given this brace to play basketball in post surgery. At first the brace rubbed and left skin irritated but was easily broken into. I don't even notice that I'm wearing a brace, it is that confortable. The only downside to this brace is it squeaks loudly like it needs oiled. Also, the plastic that holds the straps came loose and it pops in and out when I run. Other than those downsides, it's a great brace.